I watched Ferris Bueller’s Day Off for the first time when I was fifteen years old. I loved it. I still love it twenty-seven years later. At the time, the story of three high-school friends who cut class and go on a free-spirited romp through the city of Chicago struck a chord with me. Ferris, as played by a charismatic Matthew Broderick, convinces his best friend Cameron (Alan Ruck) and girlfriend Sloan (Mia Sara) to enjoy a fun day together prior to graduation. Ferris tricks his parents, defies the school principal, drives a Ferrari convertible, kisses the girl, and crashes a parade where he lip-syncs to The Beatles’ Twist and Shout. Hell, he even speaks to the audience watching the film. I was awe-struck. I wanted to be Ferris and get away with things. John Hughes writes and directs with keen attention to what makes teenagers tick, elevating Ferris Bueller’s Day Off above other 80’s comedies. Listening to a lecture from your professor – “Anyone? Anyone?” – with utter boredom and hate; hoping to tell your parents on your know-it-all brother; taking your father’s car for a spin and being both elated and scared by the prospect of being caught; having no idea of what to do with your life after high-school is over. All of these things ring true, much as they did in Hughes’ earlier The Breakfast Club (1985). The situations may be broad, even improbable at times, but they are grounded in a sense of respect for the characters. My favorite moment in the film comes halfway through, when Ferris and his friends visit The Art Institute of Chicago. 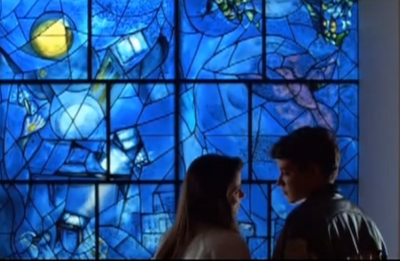 A scene of Ferris and Sloane kissing in front of Chagall’s America Windows is juxtaposed with a shot of Cameron staring at the little girl at the center of George Seurat’s A Sunday Afternoon on the Island of La Grande Jatte. It is a wonderful moment, full of meaning: In the former, the experience of two people belonging, connecting, caring for each other; in the latter, the absence of all those things. Cameron is alone in the world, a small child yearning to be loved. In fact, Cameron is the only character who makes a meaningful arc in the picture, from a scared-of-his-own-shadow neurotic to a more confident young man. And in a way, it is because of Ferris’ constant prodding – and this particular day off – that he is able to come out of his shell. As Ferris says, “Life moves pretty fast. If you don’t stop and look around once in a while, you could miss it.” Enjoy a day off with Ferris and the gang. I’m sure I will again and again for years to come.